There is increasing demand for more alternatives to gas-powered outdoor power equipment. 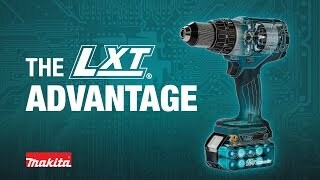 Makita is meeting demand with an expanding line of cordless OPE that includes the 18V X2 LXT® Lithium-Ion (36V) 17” Lawn Mower. With zero emissions, lower noise and none of the maintenance associated with gas power equipment, the 18V X2 (36V) Cordless Lawn Mower is a welcome solution for efficient grass cutting. It’s powered by two 18V LXT® batteries (batteries and charger sold separately) for maximum power and run time, but without leaving the 18V battery platform. 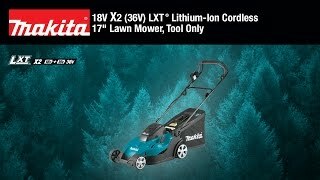 The Makita-built motor delivers 3,600 RPM, and the Mower offers ease-of-use features including quick height adjustments, a 13 gallon capacity grass collector, and a full 17” cutting width. Using two 18V LXT 5.0Ah batteries, the Lawn Mower delivers up to 30 minutes of run time. Shipping Weight : 45.1 lbs.